After the epic labour, H was wheeled away and I was left with C for the first time. 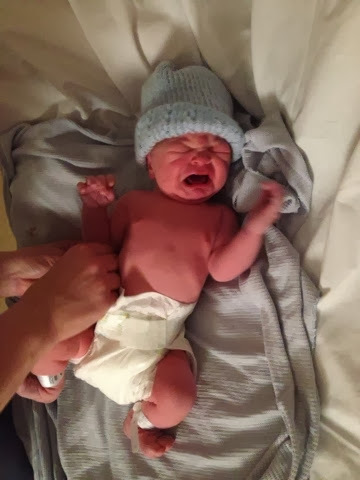 With an oversized beanie on he looked like a gangster rapper or something, and the midwife said I should get him dressed. I was terrified. I held the little white vest and he lay there bawling. I was worried I would break his arm or something, he was so little, and new, I didn't want to do it in case I got it wrong. The first thing you realise about being a dad is fear: there is a baby who needs your protection (and this includes warmth) and I was scared because I didn't know how to dress him. Naturally the midwife put his vest on with effortless ease and then showed me how to put his babygrow on. It took me quite a while to do it but I felt pride when I managed to close the final popper. I was fearful because there was a huge outpouring of love for this baby, realising he was mine to look after and nurture and even after I managed to dress him he was still crying. Lesson number two of new dad school was to try to settle this baby! Instinct kicked in and I came up with a song about a monkey in a tree and I cradled him, swaying and listening to his weak cries and realising yet again that I would do anything within my power to protect him for the rest of my days. Please comment and subcribe via Bloglovin or follow me on Twitter!